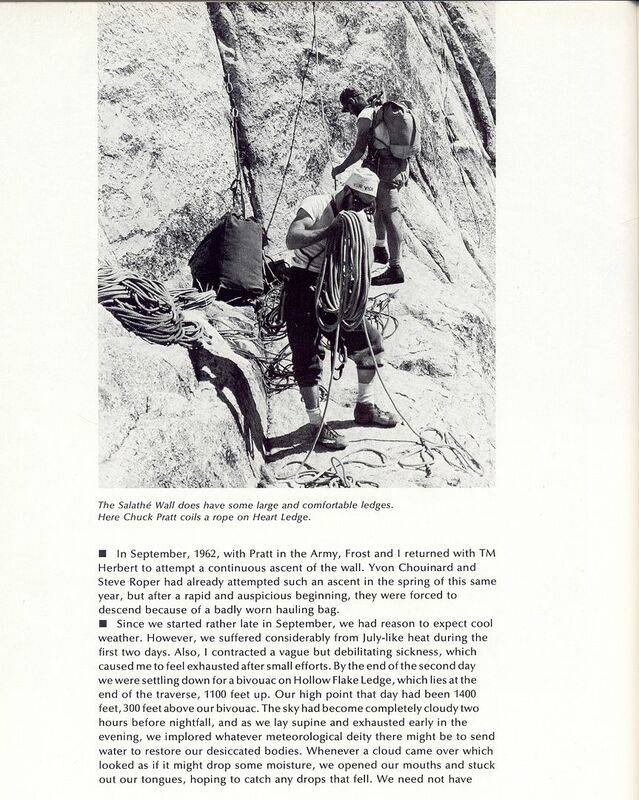 This year we celebrate the 50th anniversary of the first ascent of the Salathé Wall by Royal Robbins, Tom Frost and Chuck Pratt in September of 1961. 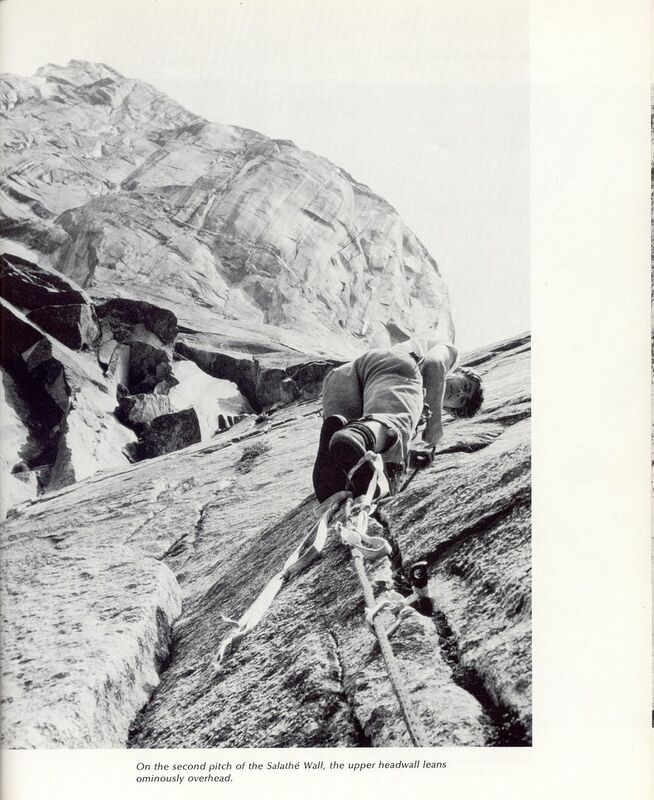 This lavishly illustrated account of the first ascent and first continuous ascent appeared in Galen Rowell's superb Vertical World of Yosemite, 1974. Many of the photos are Galen's own shots along with the classic Tom Frost images. 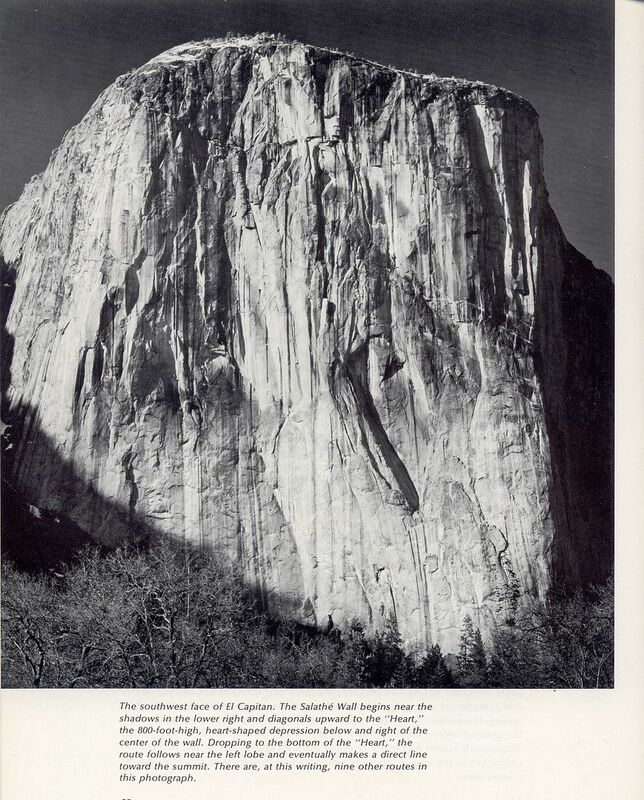 A gathering in celebration of the 50th anniversary of the first ascent of this great route is scheduled in Yosemite Valley on Saturday October 22 this season. Stay tuned for more details from Ken including getting T M Herbert to attend. 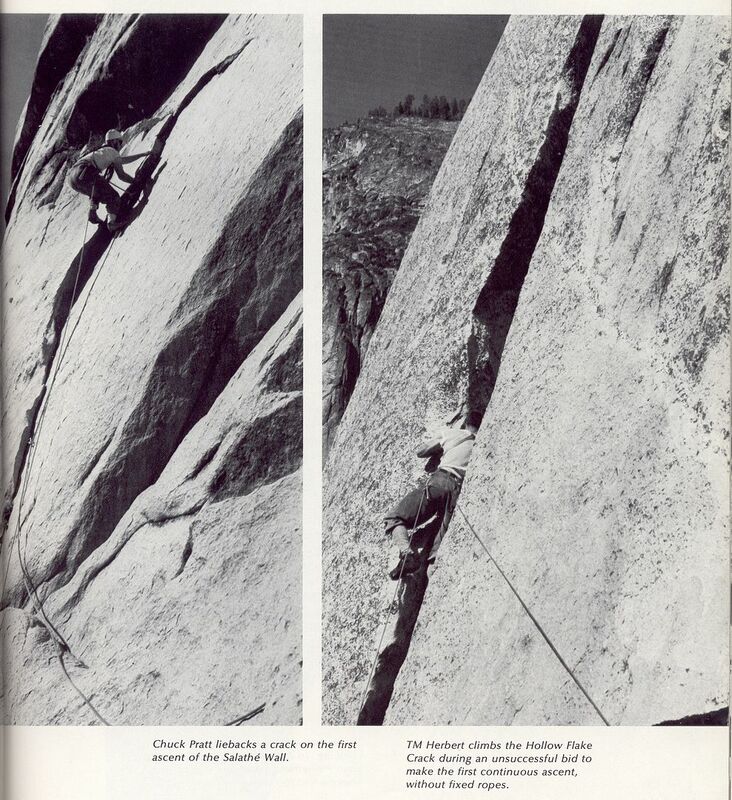 He was involved in the second attempt at a continuous ascent after Roper and Chouinard gave it a go! Maysho or TC you guys have to rope him into it! Royal and Tom will be signing books and prints at the Mountain Shop in Camp Curry from 3 - 5 pm on Saturday 10/22 and in front of the Ansel Adams Gallery in Yosemite Village on Sunday 10/23 from 11 am to 1 pm. Stop by and take home a bit of what these amazing men are offering! The main event will be starting earlier and ending later than ususal so that everyone with questions will be accomodated. The evening will start at 6:30 pm as per my last conversation with Tom. Check this OP for any updates or changes. Thanks Steve. 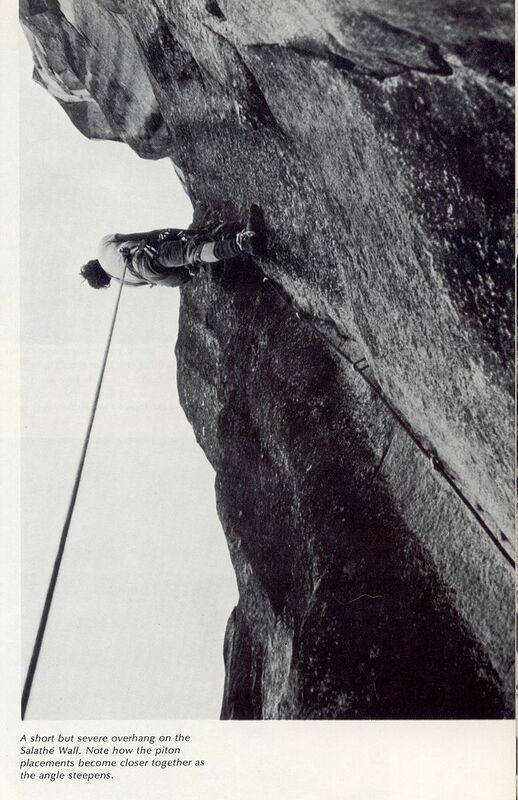 My favorite shot of Kor, a great man, a great climb. A day or two after finishing the Salathe, a bespectaled, wiry looking guy approached us along the road at El Cap meadows asking what we had just climbed and what kind of rack he should take for it. We gave him our recommendations and he thanked us and headed back to his rig. My partner and I simultaneously looked at each other blurting out "that was Royal Robbins, wasn't it?" A very curious juxtaposition, mega noobs being asked what rack to take by the master first ascensionist. 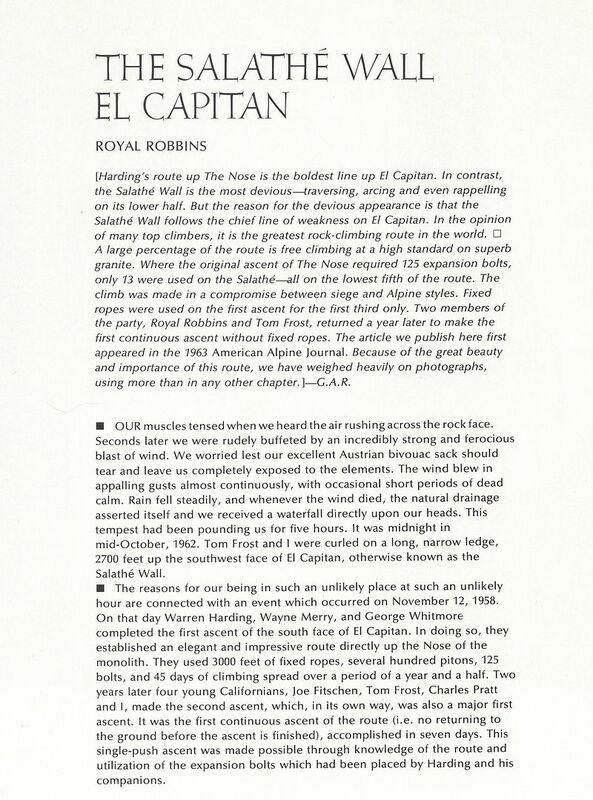 A 15th anniversary ascent in the bi-centennial year of 1976, way to go RR, what a masterpiece. My 40th or 39th, can't remember which, anniversary. 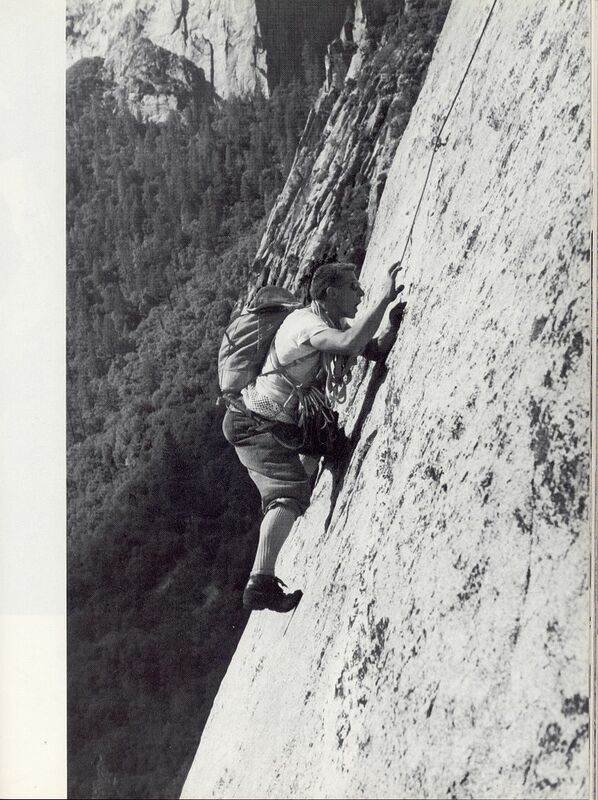 My first and most memorable El Cap route, did it with Steve Arsenault. edit: When I did the Salathe I had yet to do a Grade V and people questioned my preparation. I responded by saying that a Grade 6 was merely a collection of Grade 4's where instead of going back to camp at the end of the day you stayed up on the wall- worked out just fine. Thanks Stevie for posting this great classic account and pointing attention to the route. Yeah, my fortieth too, J-Do---just past, this July! Imagine 13 bolts on the whole shebang, all located in the lowest 1/5th of the line. That was why it wanders so, of course. 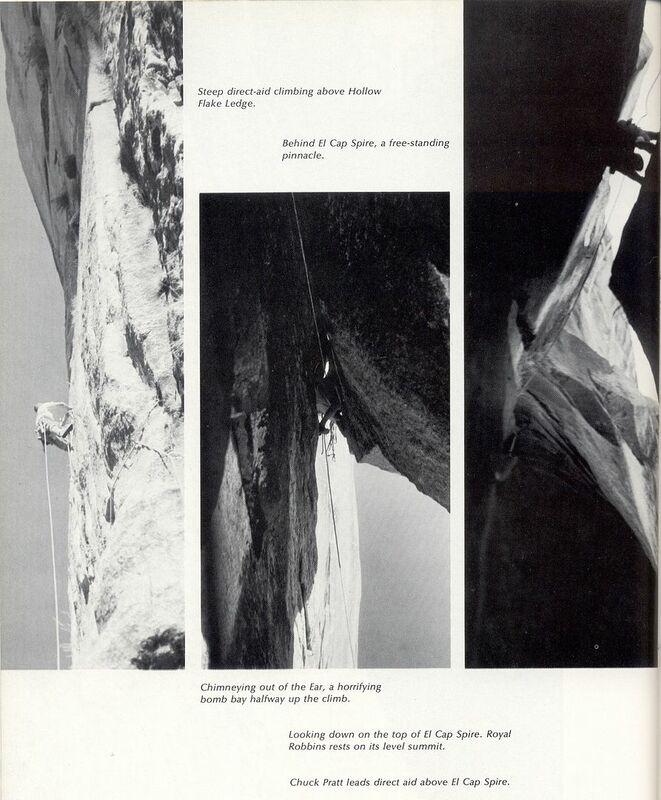 It is one of the 'greatest stories ever told' on rock and continues to be a major focus in modern climbing, now both as a free route as well as the great classic mixed route of our golden era. It would be interesting to hear from all the Supertopo posters from that generation and what ascent(if they can remember) did they do. IE first , third, fourteenth. I bet there is quite a collection. Post up, men. 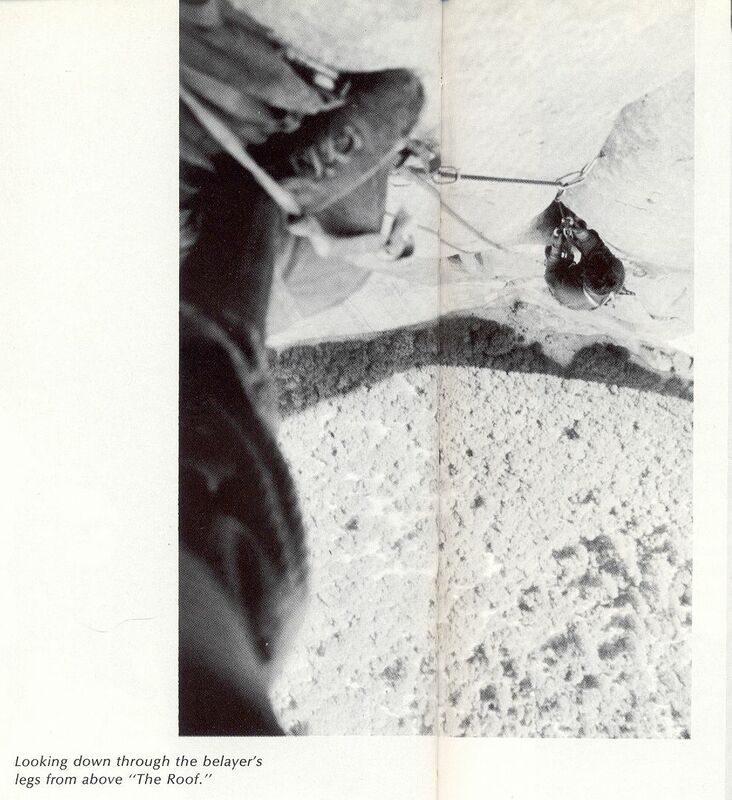 Thanks to Bill Amborn this gem in the Mountaineering Notes section of the December 1962 Sierra Club Bulletin. Great pics and thread. 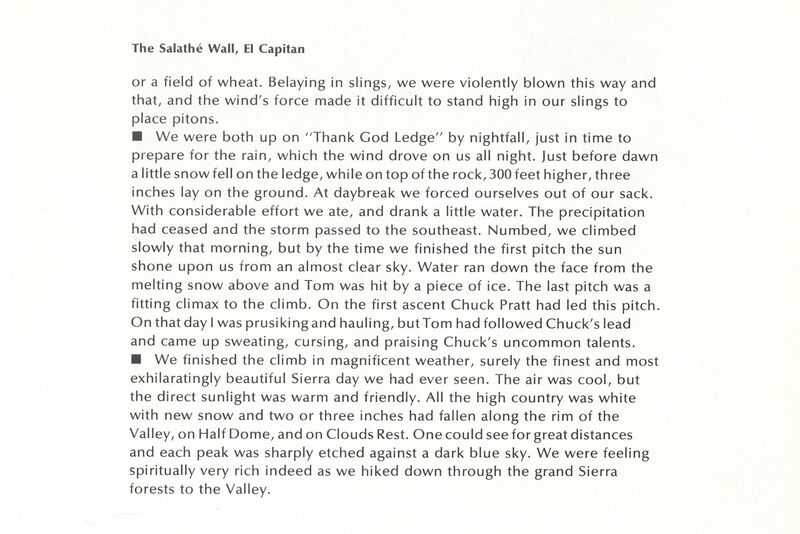 The Salathe was my first El Cap climb, first big wall, and an amazing experience all around. I popped a cam and took a nice lead fall at the lip of the great roof, had to jug my lead line about 10-15 feet to get back on the wall. Wild!!!!! 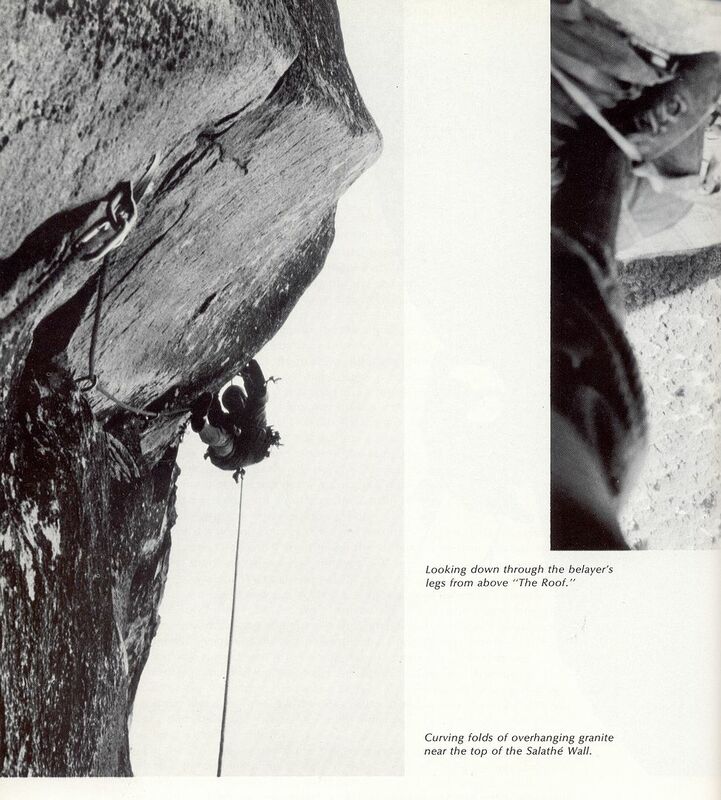 The article in Rowell's book certainly inspired many to do it, including me and my 2 college climbing pals. 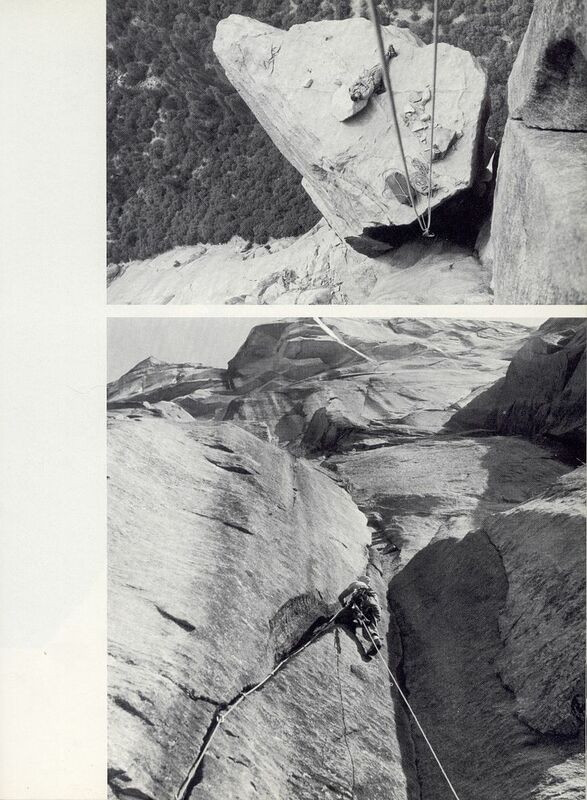 By the time we got to it (1985), cams, sticky rubber and topos had mostly tamed it. And having a giant cam eliminated some of the hardest mandatory wide moves, except for a little on Hollow Flake and The Ear, which still keep the crowds down. That those guys were able to keep the bolt count at 13 and not exceed 5.9+ is truly amazing! 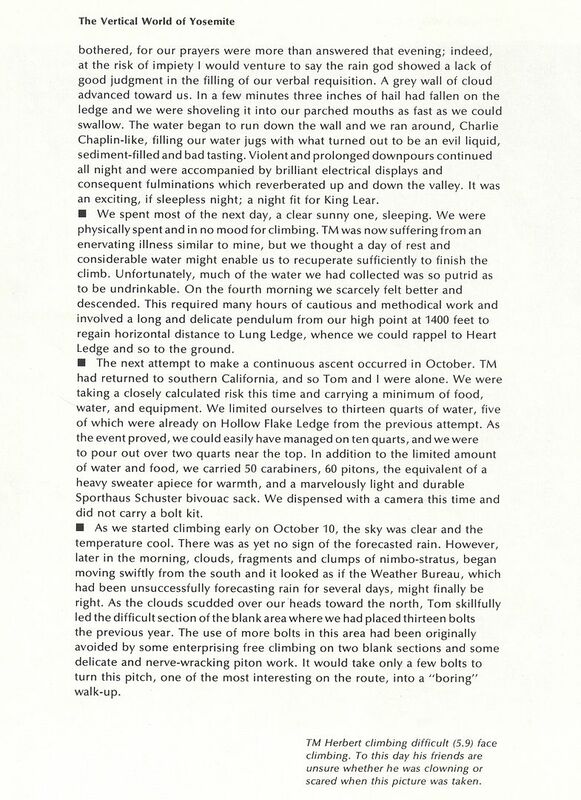 When I did it in 74, we had forgotten the guide book so my buddy ran back to the road and copied the description on a piece of lens cleaning paper, a very abbreviated version, maybe six sentences for the whole route. Back then, we could count on one fixed piece per pitch and one fixed piece per anchor. I was the "free climber" of the team but didn't consider myself a confident 5.9 leader. I remember approaching the Ear with a lot of trepidation because Kor had said it was scary. Turned out to be a lot easier than expected with good footholds and even gear. Dang! Thanks, Pat, the feeling is completely mutual. 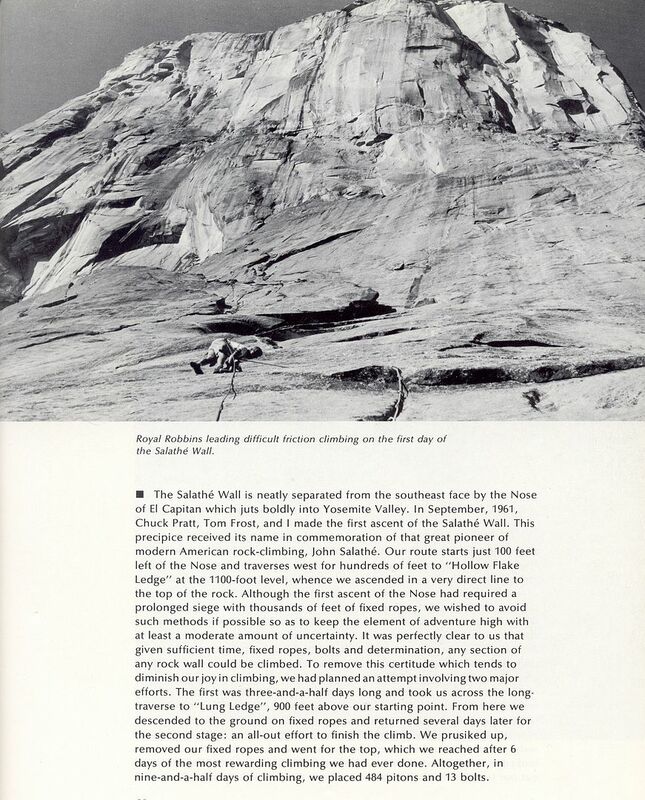 PS, given that I'm not dead yet and the 40th anniversary of my first ascent of the Salathe is coming up in 2014, I'm planning to gather a group of young bucks to haul the Freerider for me so that I can go back and climb it "as free as can be" for me! The Ear. Probably not the difficulty so much as the exposure. 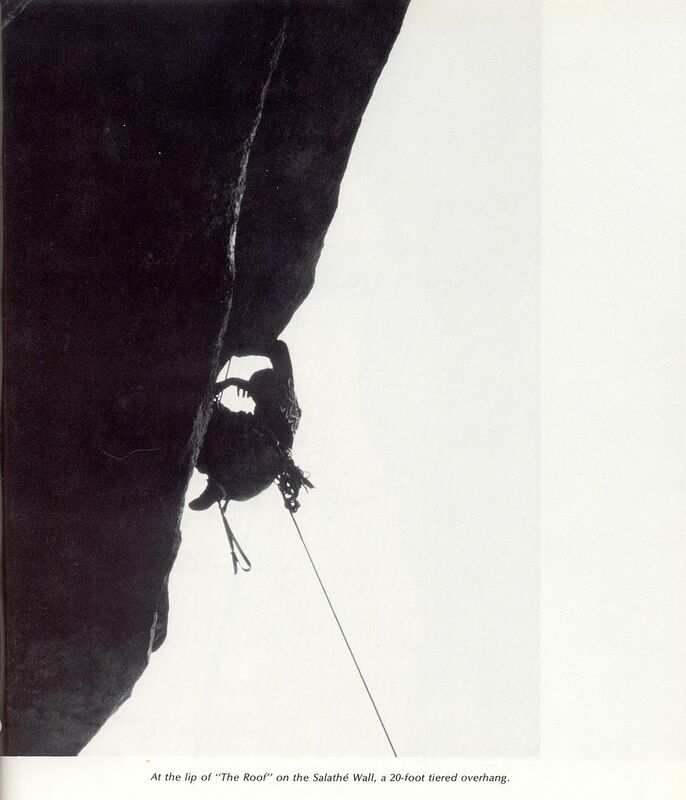 know how far climbing would progress in the coming decades? Steve's intro is entirely accurate. 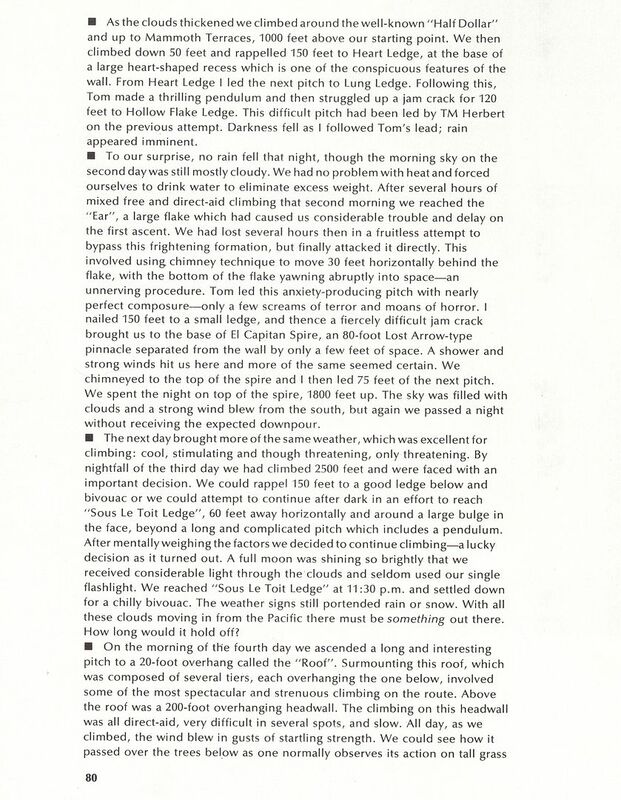 And in the first paragraph of the article, Rowell mentions that the text is taken from the 1963 AAJ. However, the photo selection and captions are by Rowell. 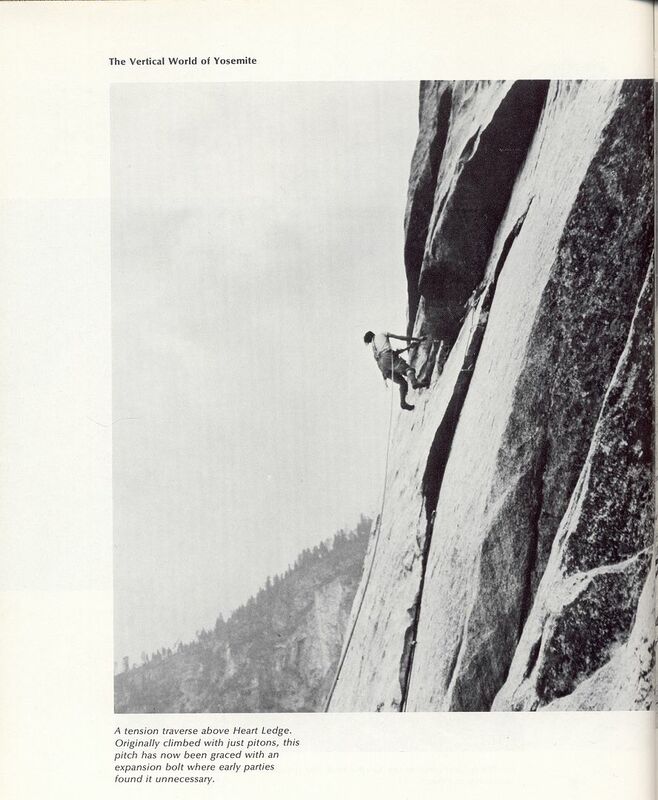 "Royal Robbins leading difficult friction climbing..."
Thanks for the memories Steve. 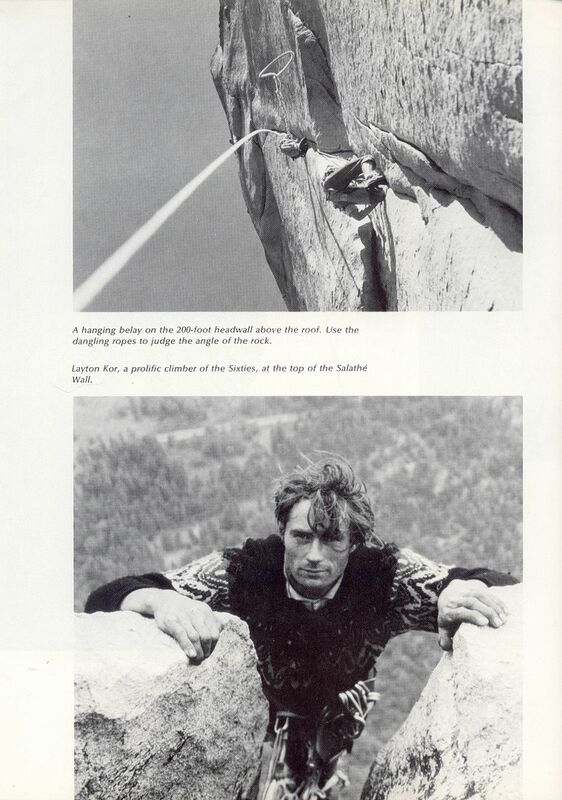 Climbed the Salathe in '76 with Max Jones. My first El Cap route and my 2nd big wall. 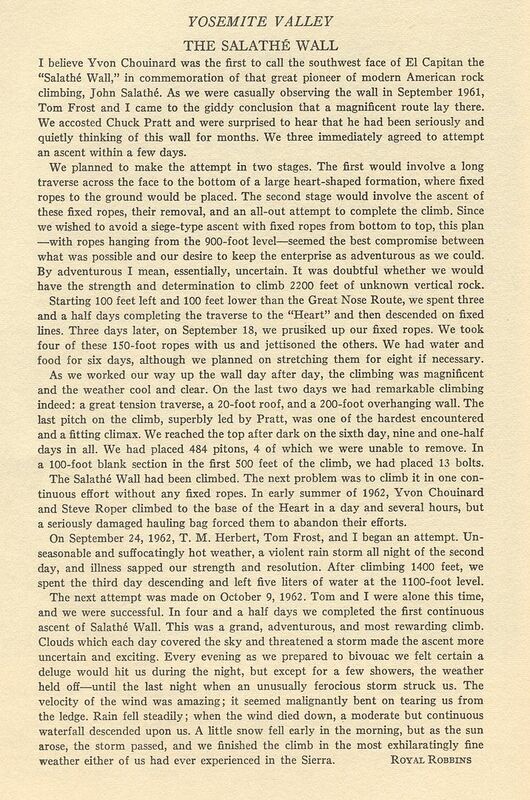 Great history and great climbing on that route - felt like we were following in some powerful footsteps. Loved the experience! Awesome read, thanks for posting.